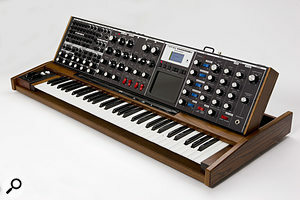 The Minimoog Voyager XL is a classy-looking beast, which, according to its manufacturers, “starts with the heart of a Minimoog”, including its classic oscillators and filter. Augmenting these is a well-appointed patch panel, which allows you to route CVs (Control Voltages) between the synth’s own modulation sources and destinations, or to and from external synths or synth modules. There’s a four-channel CV mixer, for combining modulation signals, a two-channel CV attenuator, plus three four-way mults, which allow you to route single CV sources to multiple destinations. Moog Music are keen to point out that, although there’s no dedicated CV input for modulating filter spacing, the Modulation Buss section does allow you to route the Mod 2 input to control it. MIDI looks well implemented, with all knobs being MIDI controllable, and also capable of outputting MIDI. The LFO can be MIDI-synchronised, and the 61-note keyboard, naturally, also sends out note data. An assignable ribbon controller runs along the top of the keyboard, and finally, there’s a touch pad, of the same type that can be found on the original Voyager By Bob Moog. Pricing is yet to be confirmed, though you won’t have long to wait: Moog’s UK distributors Source tell us that the Minimoog Voyager XL will be shipping in the UK from January.